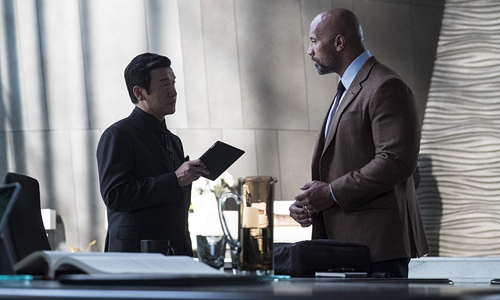 The maximum capacity for Dwayne "The Rock" Johnson's presence at the box office may have been reached this year, in which he stars in not one, but two disaster movies that made it to the big screen. One features towering gorillas, wolves, and lizards slamming into and destroying a city's highrise buildings, an adaptation of an ‘80s videogame franchise. The other features … uh, different kinds of monsters who are also out to destroy a high-rise building, and while it may not openly claim as much, it's also essentially an "adaptation" of something popular from the ‘80s. Both really shouldn't be able to be lumped together so easily, yet in Skyscraper there's too little of interest within the crumbling architectural chaos to stand out, resulting in a sufficiently boisterous yet entirely forgettable doppelganger of the action genre that lacks a Rock-solid character foundation. Ten years before the events in the film, ex-military hostage negotiator Will Sawyer was injured in a complicated scenario, resulting in his leg being amputated and in that side of his career reaching an end. Cut to the present day, where he's found a new path as a security analyst of sorts, and he's landed one of the biggest jobs possible: to analyze and report on the safety protocols of a building in China, The Pearl, that's roughly triple the height of the Empire State Building. This isn't just a building, though, designed to be an all-inclusive ecosystem of sorts that stretches to the clouds, utilizing modern energy methods, sporting inhouse organic growth initiatives, and boasting state-of-the-art issue detection throughout the site. As Sawyer's finishing up the final bits of his presentation, the building falls under attack from those with seemingly little on their minds outside of tearing down it down. With his wife (Neve Campbell) and children trapped inside, Sawyer's knowledge of the building gets called to action in a rescue mission. 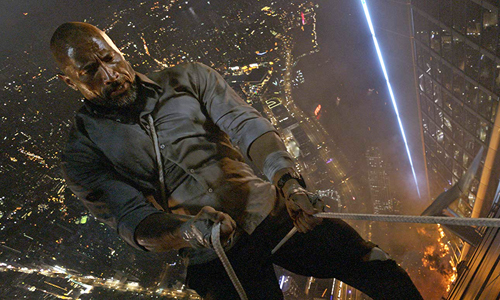 Skyscraper has no delusions over what it's mimicking, and that can be seen in the measures it takes to diverge from being an unnamed reimagining of Die Hard, as if following a checklist. A famous tower quickly becomes the focal point of the setting, of course, yet its science-fiction addons and geographic location give the writing a slightly more substantive and contemporary agenda, forming the Chinese building into a beacon of clean energy and combating urban sprawl. Sawyer's a capable rule-bender willing to traverse the perils of the building under attack, yet he definitely isn't a divorced police detective estranged from his loved ones, instead the unshakable -- and, admittedly, vanilla -- patriarch of the ideal nuclear family. Some incredibly blunt exposition gets those core points across, combined with extensive and obvious computer-generated effects involved with the building's tech advancements. Skyscraper feels like an expanded, yet toned-down and less-interesting riff from the moment it breaks ground. The cards are stacked against those who want to criticize Sawyer as the hero of Skyscraper: coupled with Dwayne Johnson's inherently charming, grinning persona, he's portraying a combat veteran who also copes with being an amputee in his everyday life of being an honest contractor and doting father. Thing is, the story relies too heavily on these sterling character traits and not on other potential layers of his personality, letting those base qualities go on autopilot with effortless assurance that those watching will feel obligated to root for him. The Rock tends to be at his best when he's allowed to flex at least a little of that raised-eyebrow, roguishly confident muscle from his pro wrestling days -- something that can be found in San Andreas and Rampage= -- yet there are limitations on Sawyer through his paternal instincts and boy-scout demeanor that inherently put that facet of Johnson's persona on lockdown. Neve Campbell's combat-medic wife is more interesting, humorous, and ultimately underutilized. Even the most milquetoast of heroes can be elevated by the right kinds of action-movie intensity exploding around them, though, making demands of their physicality and responsiveness … and few settings are as volatile or hazardous as a collapsing, flaming, technologically advanced Skyscraper. This occurs just as the sun begins to set in China during Skyscraper, though, which results in nearly everything taking place in orange-tinged darkness, clunking around in the shadows of an almost-entirely vacant high-rise tower. The "terrorists" overtaking the tower are an immensely forgettable band of gun-toting goons, lacking a compelling face for their operation outside of a few higher-level mercenaries with advanced skills, turning The Pearl -- the building itself -- into the prime force-of-nature villain of the movie by default. Sawyer's handling of explosive and high-wire obstacles breaks little new ground, if any, barely amped up by how the writing handles mandatory obstacles installed throughout The Pearl, as well as one sequence that makes generous usage of the ex-soldier's prosthetic leg. Due to the nighttime action shrouded in darkness, the villains' shrug-worthy (and entirely familiar) motives, and a determined yet boring hero tearing through it all, Skyscraper struggles to conceal that it's a shallow, over-the-top exploit that's uninterested in taking extra steps to answer "…why?" about many things. From the architectural and technological designs of The Pearl to its haphazard digital security measures and choices made by the bad guys amid their takeover, most of those concerns must default to the explanation that, yes, it's a blockbuster designed for thrills and not to be surveyed too closely. For some things that become integral to the action -- such as the entire reason The Pearl's observation deck can double as a carnival funhouse of mirrors -- that explanation doesn't really cut it. When the cinematic materials are assembled like this, they aren't sturdy or distracting enough to roll with the utter predictability of how things go down in Skyscraper, let alone overlook the pop-culture blueprint followed during its creation.